1/4 of Oz watches soccer, will sponsor dollars shift? David Beckham is in town, but it’s not only hype surrounding the visiting superstar and his LA Galaxy entourage – there’s data, and it suggests sponsorship of soccer should be increasingly more attractive to Australian brands. Roy Morgan Research has released figures showing that 4.22 million Aussies, or 23% of the population over 14 years old, now watch soccer on television. This represents a 10% increase in the number of people watching soccer on television in Australia over the last five years. Two thirds of these viewers are men, which means 31% of Australian males aged 14 or over are watching soccer on television. The data includes any soccer televised here, with the FIFA World Cup being most popular, enjoying a regular audience of 3.7 million when it’s held every four years. Ranking second is the English Premier League, with 1.74 million saying they almost always or occasionally watch matches. And 1.34 million report they regularly watch televised matches of Football Federation Australia’s top-tier professional league, the A-League. 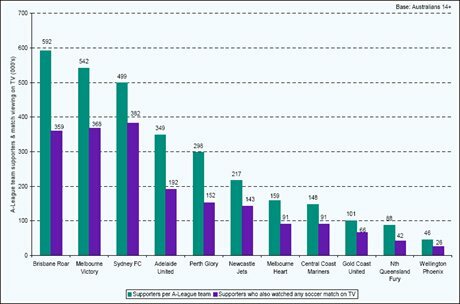 Based on number of supporters, Brisbane Roar wins the popularity stakes with 592,000 supporters, followed by Melbourne Victory with 542,000 supporters, and Sydney FC with 499,000 supporters. Those figures are represented in green on the below chart. The purple bars represent the number of supporters who also said they watch televised matches, which sees a reversal of those top three teams.